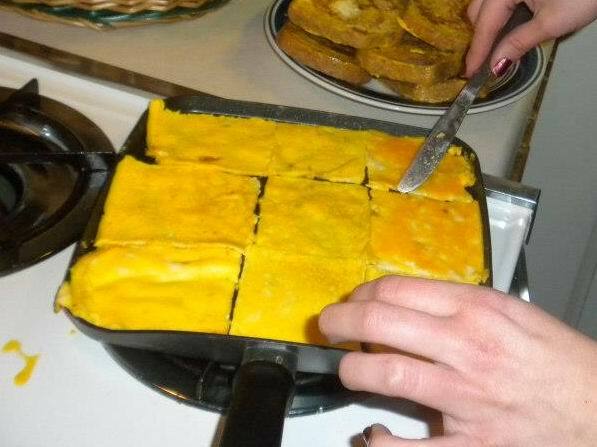 For each slice use one egg and a dab of milk. I use a large container and make 8-10 at a time. Beat eggs and milk, dunk bread. I let it soak up as much as it can. Cook until completely done. Place on cooling rack. Add eggs to pan and cook in one piece. Cut into amount of servings of bread you have. IE, 8 slices of bread 8 pieces of scrambled egg flats. Also place on cooling rack. FREEZE all! When frozen place in freezer zip bag. Take out a piece of French toast and a piece of egg scramble and place in toaster. Pop down. Egg usually takes just one turn and bread two. Easy easy!! YES, I put eggs in my toaster! It does require adult help to get the egg out with tongs. 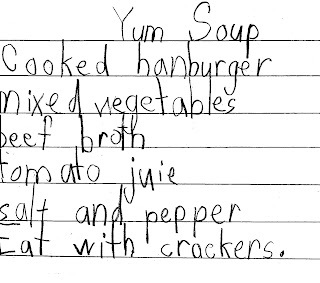 This recipe is courtesy of my first grader. They made this as part of a social studies project. Some of the students in her class brought something to add to the pot and since it's made by kids you know it's easy and for it's simplicity it is tasty! I use my homecanned vegetables, juice and broth in ours. Throw in a pot, heat, and eat! 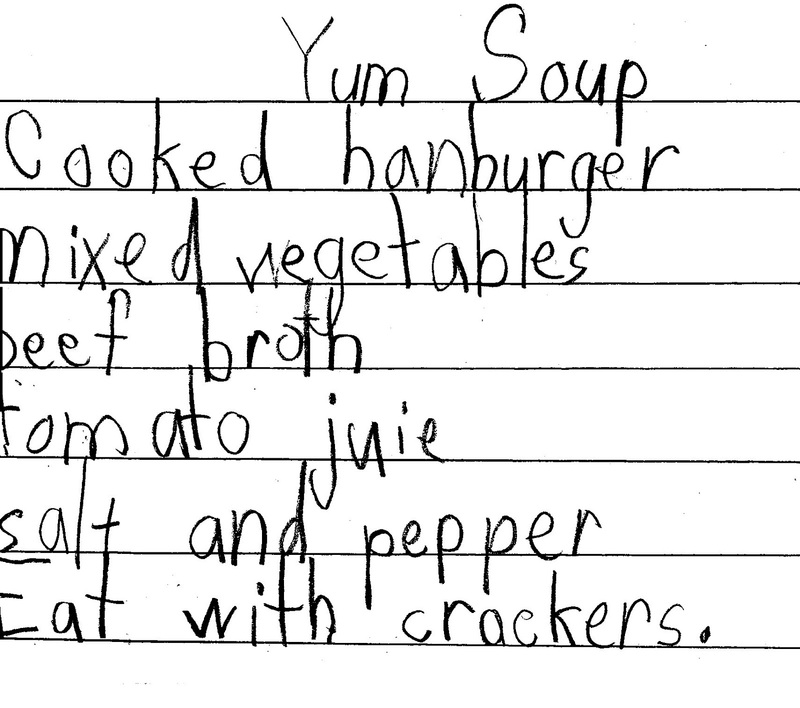 Here is a scan of the recipe she brought home. Luckily she was able to give me more details and measurements. Separate eggs, one at a time into a small bowl making sure there is NO trace of egg yolk in the white. If there is you must discard the egg white and start over. If it is ok then dump it into a medium bowl. After you have been successful with all 3 you can add the cream of tartar and beat on medium high speed until soft peaks form. Slowly add sugar about 1 tablespoon at a time until all of the sugar has been added. Continue beating until the whites are stiff and glossy. Add vanilla and beat just 30 more seconds. Preheat oven to 200 degrees. Line two large baking sheets with parchment paper. Fill frosting bag fitted with a large frosting tip of your choice with meringue. Pipe meringue onto parchment in 1-1/2 inch cookies. They won’t expand much so you can put them as close as 1/2”. Sprinkle on crush almonds or finely chopped walnuts. Bake for 1-1/2 hours until dry and crisp. Cool. Keep in airtight container. 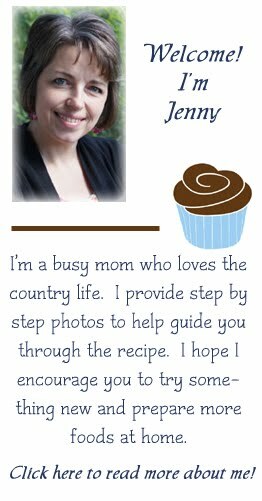 Try to use them within a day or so if you can as they will soak up any humidity around them and become sticky. If they do you can sprinkle powdered sugar on the serving dish before you place them and sprinkle a little more on top. Even if they aren't sticky that makes a pretty presentation. These simply melt in your mouth!! Preheat oven to 425 degrees and place a 9 or 10 inch cast iron skillet inside. Allow it to heat while you make the batter. 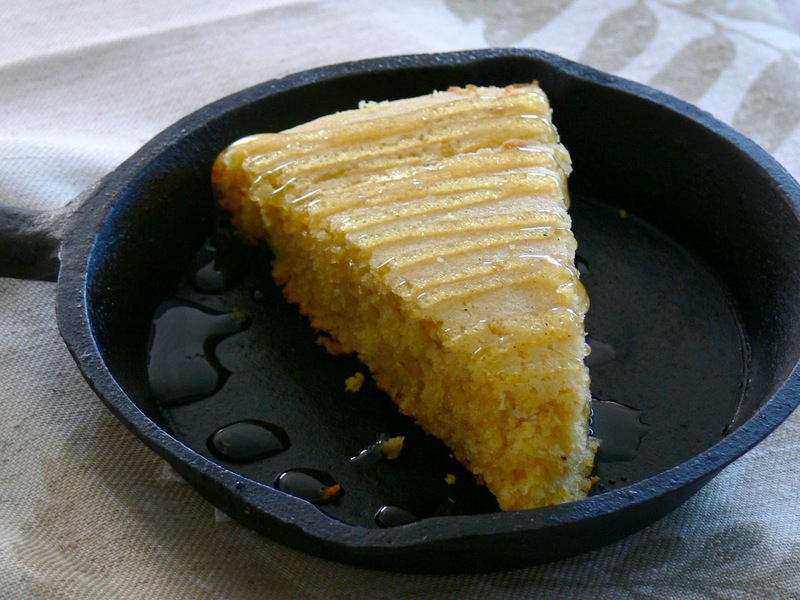 In a large bowl, whisk together the cornmeal, flour, sugar, baking powder, and baking soda. In another bowl whisk the milk, buttermilk, eggs and almost all of the melted butter. Keep back about 1 Tablespoon for the skillet. Remove the hot skillet from the oven. Reduce oven temperature to 375 degrees. Dump the other tablespoon of butter into bottom of hot skillet. Use a pastry brush to brush it up on sides. Pour the batter into the skillet and place in the oven. 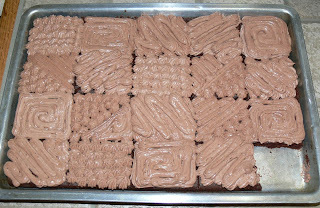 Bake until the center is firm and toothpick inserted into the center comes out clean, 15 to 25 minutes. I found that 15 minutes was plenty for my 10" pan but each oven and pan can differ. It is a really moist cornbread but not a very sweet cornbread so we drizzled honey on it. YUM!! I love guacamole but don't always have the time to chop or want to make a mess. This is a quick and easy way to cheat your way to guacamole! Mash avocado in small bowl, add about 2 Tablespoons or so of drained salsa and 1-2 Tablespoons of sour cream. Mix and enjoy without all the chopping and mess!! Preheat oven to 350 degrees. Dump cake mix, pudding, water, and egg whites in large bowl. Beat on low until incorporated, then on medium for 2 minutes. Pour into a greased jelly roll pan. Bake for 13-18 minutes or until toothpick inserted comes out clean. Cool. When cake is cool and you are ready to frost place milk and pudding in medium bowl and whisk for 2 minutes. Let set for at least 15 minutes. Fold in whipped topping. Slice cake and then frost cake. I used a frosting top to make designs on each slice of cake. Keep in fridge until ready to serve. Preheat oven to 350 degrees. Put cubed bread in medium bowl, drizzle some of the olive oil, toss, drizzle rest on. If it is not coated as you like you can put a little more oil on but don't drench it. If you want a little salt or other seasoning such as garlic or ranch then put it on here while the bread is wet. Be sure to add a little, toss, then add more so your top pieces aren't what gets all the seasoning. 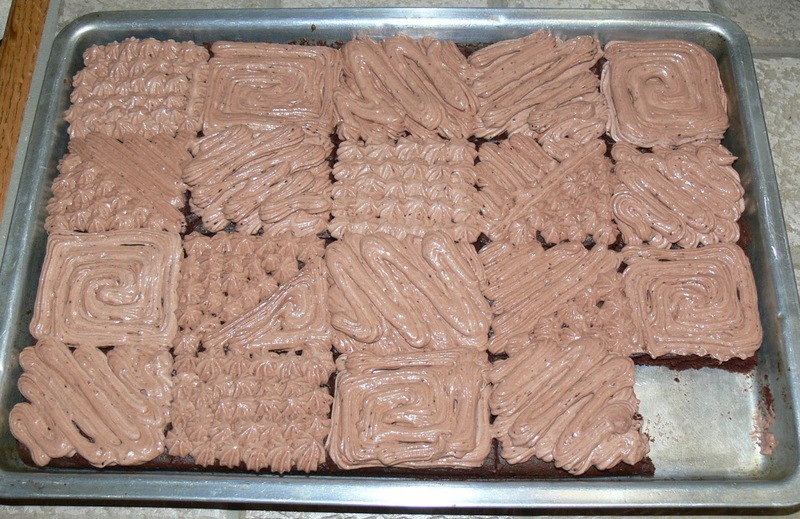 Dump onto cookie sheet and make sure they are in a single layer. Bake for 10 minutes, toss/turn. Go an additional 5, toss/turn. Taste one of the croutons if they are not nearly crunchy and aren't too brown you can throw them in for another 5 minutes. You don't want burns croutons but you do want the moisture out so they last. They will completely firm up when they cool. Put into a plastic container with an airtight lid or a zip shut bag. You can us them on salads or soups.